Frogs are tailless amphibians that are mostly carnivorous as they tend to feed on small insects. 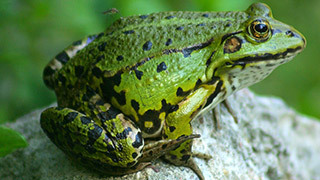 Frogs can be found around the world, but the largest concentration of frog species can be found in tropical rainforests. Frogs lay their eggs in water, these eggs hatch into aquatic larvae with tails and gills, these larvae are known as tadpoles.